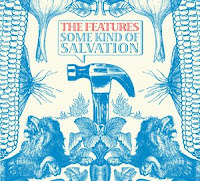 Atlas and the Anchor: The Features - "Some Kind of Salvation"
The Features - "Some Kind of Salvation"
After four years, The Features are set to release their second album, Some Kind of Salvation on July 28th. Their eccentric mix of folksy Southern charm, and energetic, off-kilter pop is a welcome respite from the state of radio today. "Whatever Gets You By" opens the album with a short and quirky, sing-a-long set to a shuffling beat that bleeds into the first single, "The Drawing Board" that should get a ton of radio attention with it's infectiously catchy chorus and bleating saxophones. "Foundation's Cracked" is piano-driven and spotlights songwriter/vocalist/guitarist Matthew Pelham's emotional, yearning, Southern-style vocals. The next song, "GMF (Genetically Modified Fable)" infuses the most psychedelic XTC-like melody into a 70's glam-rock stew with great vintage keyboard sounds that makes for one of the more compelling songs on the album. The uplifting song, "The Temporary Blues", could be adopted as a national anthem during these hard economic times, with lyrics like, "One day we're gonna make a change. We're gonna turn this mess around." The saxophones return on "Wooden Heart" with a steady swagger. The acoustic guitar and clicking percussion on "Baby's Hammer" mix well with the plinking piano and pretty violin arrangement for a nice change of pace. Near the end of the album, The Features throw in a nod to their energetic, New Wave past with the electronic drums and 80's inspired synths of "Concrete". Some Kind of Salvation should make many year end lists because of the accessible yet off-center pop sensibilities and stellar songwriting skills that The Features...feature yet again. For more info click here: http://www.thefeatures.com/ For the price of an email address at their site, you can download the song "GMF" for free! Middle Class Rut - "25 Years EP"
Magic Wands - "Magic, Love & Dreams EP"
Alligators - "Piggy & Cups"